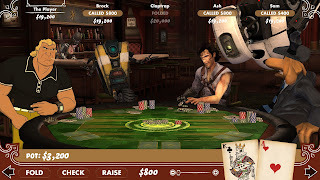 In November 2010, Telltale Games released Poker Night at the Inventory, a unique poker game that pits characters from different franchises against each other in the classic card game. Characters such as the Heavy from Team Fortress 2, Tycho from Penny Arcade, Max from Sam and Max and Strong Bad from the Homestar Runner series would be your competitors, and one of the best things about the game was listening to the banter between the various characters. 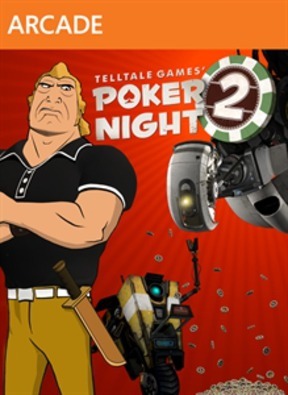 Telltale have now developed a sequel, Poker Night 2, which is based on the same idea with a whole new roster of characters. The first game was awesome, but do we need another poker game? Read on to find out the full verdict. Poker Night 2 starts with you arriving at the Inventory, a secret underground poker club, to compete in some high stakes poker. And this is where the game gets interesting. Your opponents are Brock Samson from The Venture Bros., Claptrap from the Borderlands series, Ash from The Evil Dead franchise, and this time Sam takes the reigns, whilst Max sits nearby. The dealer for this game is the one character you would not expect to see at a poker game, GLaDOS. All of the characters interact with each other, and the conversations in this game are among the best in any video game. They feel so real, especially as each of the characters references their own games and stories. GLaDOS puts you down whether you win and lose, just as she does in Portal. Claptrap takes his one step further, by acknowledging Borderlands 2 as a video game, and offers the other characters a part in an expansion pack. The humour is fantastic, and the whole game is beautifully written. It makes a simple game of poker so much fun. Most of the time will be spent just watching the characters chatting, having drinks and making jokes. 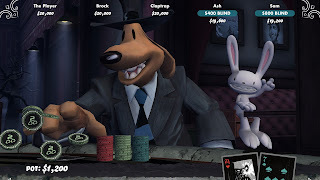 There isn't much to talk about regarding the gameplay of Poker Night 2, as it is simply poker. You can choose from the Texas Hold 'Em and Omaha variations of poker, each offering a different way to play. The main aim of the game is to win hands and tournaments to earn money, inventory tokens and bounties. The bounties consist of a special item from each player, which is offered to the winner at the start of a random round. These in turn unlock Borderlands 2 content, and avatar awards for the XBLA version, PS3 gamers get themes, and Steam players will receive Team Fortress 2 items. These items give you something to aim for, and make it more than just a simple poker game, even though at it's core, that is all that it is. The inventory tokens that you acquire can be used to buy various things. Mainly, they will be used for buying new decks, chip designs and table felts, but they can also be used tactically, to buy drinks. When you buy drinks for your opponents, you first see Mad Moxxi in the background, preparing the drinks whilst you continue to play. When they're ready, she'll bring them over and deliver them to the characters. Eventually they'll start to drink, and when they do, they'll show emotions and tells more easily, allowing you to more easily identify when they're bluffing. It adds a nice level of strategy to the game in a very cool way. Sam and Max are back! Poker Night 2 is a wonderful game. The banter flows as freely as the drinks, and it really does feel like an actual poker night with the guys. It doesn't matter that at it's heart this is literally a basic, single player poker game, because the characters make it so much more. Not only are they hilarious, but it's a wonderful moment when you see all these recognisable characters interacting and playing poker together. And GLaDOS as the dealer is one of the greatest ideas ever.The attention to detail is very impressive and Telltale have created the must-have poker title available right now.